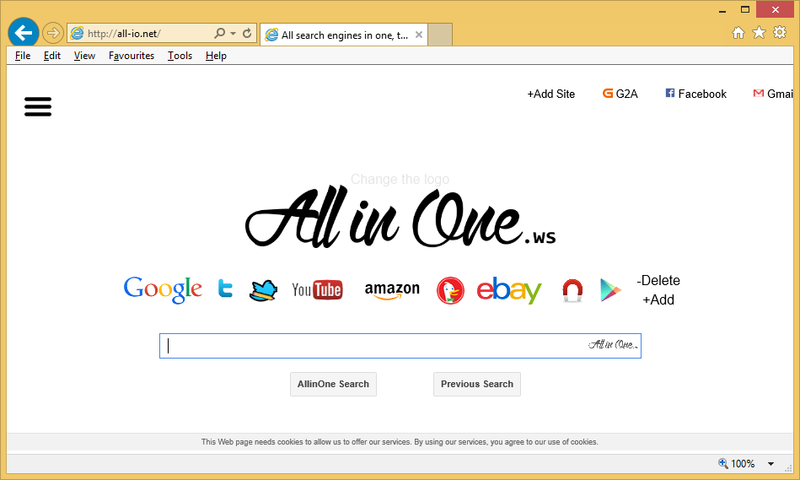 The appearance of All-io.net suggests that it is an ordinary search provider, but the truth is that it is just an untrustworthy website pretending to be a legitimate search provider. It even has some features of a browser hijacker, i.e. it can change browsers’ settings without permission, so do not be surprised when you notice that All-io.net is called a browser hijacker by specialists. Of course, it does not really matter how you call it because this does not change the fact that it is an untrustworthy search tool that has to be deleted from the system as soon as possible. If you do nothing to remove All-io.net from your web browsers and search the web using this tool, you might soon end up on pages promoting malicious software against your will. In such a case, malicious software will infiltrate your system without permission, and when you notice its presence, it will be already too late for prevention. Why should I delete All-io.net from my browsers? If you have discovered All-io.net set on your browsers, you must eliminate it from the place of your homepage/search tool as soon as possible because it might become a threat to your security and privacy. It tries to convince users that it is a legitimate search provider, but it is not that easy to fool malware experts. They have immediately noticed that the half of the search results displayed by All-io.net are nothing more than commercial advertisements opening third-party pages. Most probably, All-io.net has been created to promote all kinds of websites and generate the revenue for its creator, so do not expect that it will enhance your browsing experience. It is more likely that it will make it harder to find the relevant information on the web. Experts say that these advertisements are not the only drawback of this search engine. It might cause online privacy problems too, experts say, because it seeks to extract as much valuable information about users as possible. You can only stop all the activities it performs by going to implement the full All-io.net removal from browsers. Why do I see All-io.net on my browsers? All-io.net is opened automatically when you open any of your browsers because your browsers’ settings have been changed. Most probably, you do not know anything about this because the infection promoting All-io.net usually arrives on users’ computers illegally and do not need permission to alter the main browsers’ settings. Luckily, you can still delete All-io.net from your browsers and set a new page. The next paragraph will provide more information about the All-io.net removal. How do I remove All-io.net? You need to choose one of two removal methods if you have decided to uninstall All-io.net. First is the manual method, whereas the second one is automatic. If you choose the manual method, you will need to open the browser’s settings panel and change the default homepage/search tool. In case you adopt the automatic method, you will just need to scan your system with an automated scanner to clear your web browsers.